Whats the minimum and maximum voltage you can get out of the PSU. I'm asking because I'm trying to figure what transformers I'll need to output 110V. Does anyone know if 30VA be enough to handle the standard 250rpm premotec motors. Premotec motors are about 2 Watt 30VA is enough. The output voltage is influenced by the main psu transformer you choose. I used a 25v 25v transformer which allows two 24v ac outputs. From memory, there is only about 2 volts ac headroom if I crank the output to its maximum. I was going to implement the controller with my original 110v motor but I read about problems in this forum when driving step up transformers with the chip amp. In the end I upgraded the motor to 24v which saved a lot size,weight and coat for the controller. The nominal max is 24volts for Daniel's controller, it'll trim down to about 13 volts without adding resistors on the output. I ran mine briefly with 7x transformers as step ups, I wasn't happy with those results. I have a brand new premotec 240v that I bought many years ago. The meldano project was started in order to use this motor. I remember reading that someone did have problems but can't remember what it was or where I read it. Does anyone know which Project motors are 250rpm@50hz/16V? The few pictures I can find say 300rpm from what I can see which I assume is at 50hz. One way to select capacitors is getting the voltages about the same on each phase. I have doubts it exactly relates to ideal as the coils are seldom ideal. Not saying turns or resistance, nor even inductance. Mostly concept. From my observation the vibration is not caused by the capacitor being wrong unless wildly out. The actual voltage is the main reason. The LP12 will work between 70 and 120 V at the motor. 90 V is about right if wanting some verve ( perhaps 100 V if 67.5 Hz at 45 RPM due to inductance). When the capacitor is about right the resultant voltage between hot phases is 1.414 times the single voltage. Thus if 90 V either phase between red and blue on an LP12 should be about 127 V . In practice about 115 V if 220 nF fitted. The vibration in the typical motor is due to it drawing current as a triangle wave. I have played with this and find square, triangle and sine all work. The reason being even when square it uses current as if a filter were in place. A filter giving 10 % THD typical with a very strong 1/3 rd harmonic which is very bad news. The simple triangular window in the magnetic circuit being the reason. Like baby food sine is the better choice by a small margin if true rms values looked at. The way these motors draw current is the major problem. The hysterisis motor as fitted to Thorens/Lenco/Garrard can be better. THD down at - 52 dB typical in the stator which is like a good transformer. 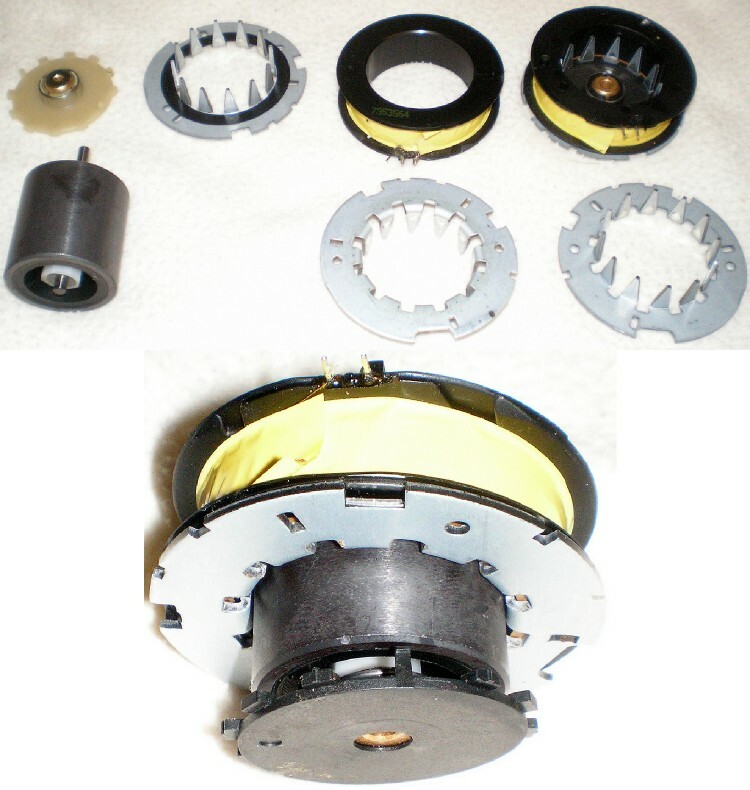 A motor is more or less a rotating transformer. That's well below 1%. These motors sacrifices some stability ( short term ) for less vibration. Having tried synchronous on a rim drive I could not get it to work. Belt drive was intended as a cheap solution when invented. In many ways it is difficult for it to escape that. The belt is a filter. Alas music is a vibration it also filters. I think I have that unsucessful motor to show. See if I can find it. This is the largest Crouzet motor sometimes called the baked bean can type. Used by Loricraft in the cleaning machines and a famous British turntable that looks like SME. This construction is mostly like all others except being a little nicer in details. Note the triangular windows that sit between the fixed magnet rotor and the identical two coils. Nothing causes the phase shift and current use except the geometry. Some will see this to be much like a car altenator. If used as one these motors make a crude sine wave ( I used a 1 watt load here or less if a typical type ). The design is exactly like a stepper motor. I suspect the 7.5 degree stepper were rewound synchronous way back in time. The true stepper needs a load to work well. Belt drive turntables might also need that ( I suspect they get that by accident ). This motor shown is a 250/300 RPM type. Even though vastly higher output is phase shifted by 220 nF like the 1 watt LP12/Rega type of old. The Crouzet is 11.5 watt. The difference being 230 V. That difference translates to about 4 when the 115 V type ( 820n F or 560 nF 60 Hz ). The most significant difference between stepper and synchronous motor is that the teeth are usualy square in the stepper motor. I have a wonderful photo of exactly that on my phone. Alas Bluetooth playing up. I just finished Daniel's dual phase controller and used step up transformers to run at 110V driving a Basis Audio belt drive motor. Works really well and with Daniel's help I managed to transformers to get 110V contrary to what others have experienced.